Arkansas Gov. 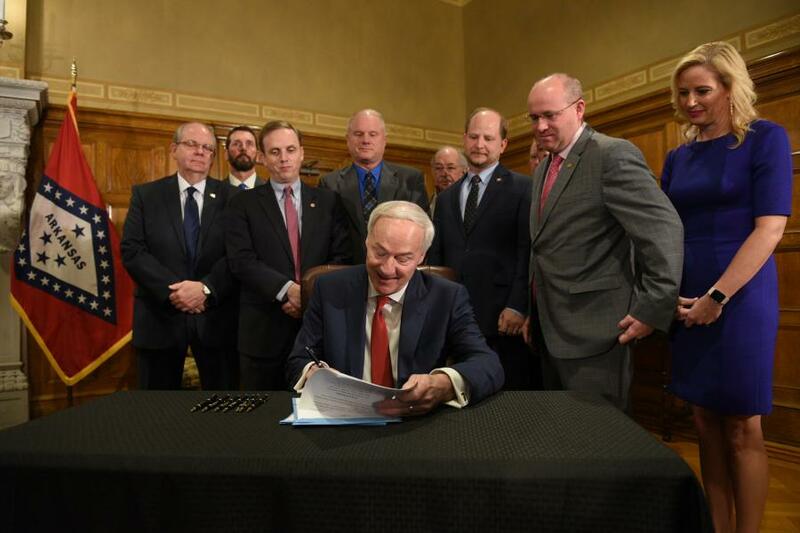 Asa Hutchinson signs into law key pieces of a new two-part, $300 million highway-funding plan for the state. The governors of Arkansas and Alabama recently approved fuel tax increases, with Arkansas also placing on the 2020 ballot an amendment that would "indefinitely" extend a half-cent sales to generate $205 million a year for highway infrastructure needs. On March 11, Gov. Asa Hutchinson signed into law key pieces of a new two-part $300 million highway-funding plan for Arkansas unveiled during a press conference in February. The first part of that funding plan relies on an "indefinite" extension of a half-cent sales tax imposed in 2012 that expires in 2020. Roughly 28 percent of the current revenue accrued via the half-cent sales tax goes towards paying off bonds for road projects. By extending the half-cent sales tax, the state would be able to shift to a "pay as we go" system, Hutchinson noted. The second part of the Arkansas highway funding plan — worth just over $95 million and now signed into law — relies on three different revenue streams. The first is a 3-cent and 6-cent increase, respectively, in the state's gasoline and diesel fuel taxes, which would net more than $58 million. Second, new and additional registration fees for hybrid and electric vehicles are expected to generate about $2 million annually. Finally, dedicated casino tax revenues backstopped initially by monies from the state's general fund adds in at a minimum $35 million. "This is a great day for Arkansas," Hutchinson said in a statement. "Our roads are vital to so many areas of everyday life. We need good streets to get to work, school, stores and doctor appointments. Our farmers need good roads to deliver their crops to the market. We need great highways if we are going to compete for the industry and business that are crucial to continuing to improve our quality of life. We have done this for ourselves and for our future." Meanwhile, Alabama Gov. Kay Ivey signed into law March 12 a measure that will increase the state's fuel tax by 10 cents per gallon over the next three years, starting with a 6-cent-per-gallon hike this year. The fuel tax will then be adjusted up or down with the National Highway Construction Cost Index and could increase up to a penny every two years, according to news reports. Ivey's road-funding plan — introduced on Feb. 27 and approved by a special state legislative session held on March 5 — also creates a $200 annual fee for electric vehicles and a $100 annual fee for hybrid vehicles. Ivey noted that the funding measure will disperse those funds between state, county, and municipal governments in Alabama for transportation infrastructure improvement, preservation, and maintenance projects. "After 27 years of stagnation, adequate funding is imperative to fixing our many roads and bridges in dire need of repair," she said. "By increasing our investment in infrastructure, we are also making a direct investment in public safety, economic development, and the prosperity of our state."